To show how waves embody emotions, I went to a beach to observe the ocean waves. Sadly, it only does it’s own thing and I can’t inflict my own feelings or emotions onto the ocean, which is very different from my room. My room’s atmosphere almost bends to my will, if I’m calm it’s calm, if I’m upset everything goes maniacal. But ocean waves do have the slow hum of the water and the rumbling (almost numbing) feeling like my air-con and the average atmosphere of my room. This means I’m on the right track. I moved on to using a tub at my friend’s house. I used different ways to create patterns to mimic how I would feel when I’m feeling different intensities of anxiety or disturbance. I found that creating a wave and letting it crash onto the edge of the tub makes a great splash effect. To me, anxiety can feel like a raging wave/ tsunami tha devastates the area. I realised I’ve also did a similar wave pattern in my flex paste model. I knew that I had to add this waveform into my artwork. 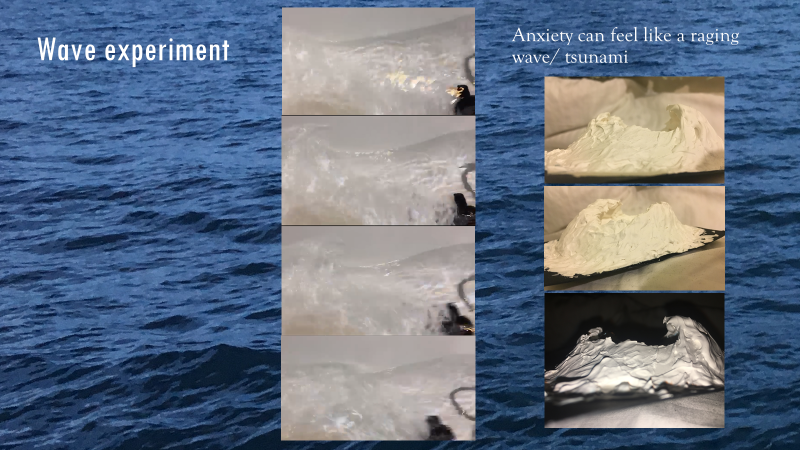 I combined my ideas with the raging wave pattern from the tub experiment, Pia Fries’s heterogeneous composition and the energy-like representation of anxiety/ calmness. Hoping to come up with an overall design for my artwork, I drew some sketches. I tried using Pia’s style and used different brush strokes and colours but it didn’t make sense to me. But I finally settled with a design. A gradient from mellow to wrath, capturing the heterogeneous nature of my room on a single plate and allowing the wave to hang over above a person, seemingly capable of engulfing them. I need the wave to represent my emotions from a calm Friday night, to when my father suddenly comes in my room or when I remember something bad again. A big crash froman unseen force almost. Originally I wanted to show how my room comforts me, but now I wanted to show how it changes it’s atmosphere, and how it understands with empathy. This has to be it. Some have suggested me to depict two wave crashing into each other. It would be very majestic, but to me, only my room has such a virtual wave. 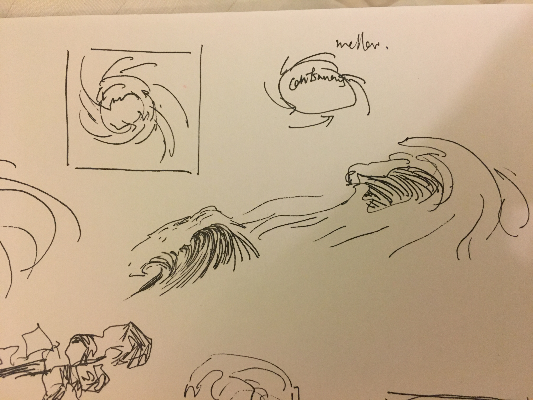 For the suggested two waves, not only my room, but the area outside that represents choas should be depicted as waves too. It would lose my room’s special function of being a comfortable place represented as a mellow/ calm wave. I would rather only have one big wave to show tht it’s special to me personally. Hopefully I can let others undertands my room’s most valuable ability ans feel what it can become, going along with me emotions to become the saddest place I know.